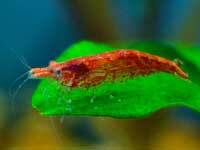 The red cherry shrimp (RCS) is fairly hardy and adapts to a wide range of water conditions. Because of the red cherry shrimp's small size and relatively low bioload these red shrimp can usually be kept in smaller confines. Larger tanks are needed to keep multiples alive and happy for the longer term though. Even though they can be kept in smaller tanks, they still need very clean water with turnover of 5 to 10 times per hour. A lot of shrimp keepers use sponge filters in their tanks even though a canister filter (if maintained properly) or a power filter could be a more efficient filter to use. Make sure that you never use any medications containing copper with your shrimp. If you have used medicines containing copper in the past you will want to run some cuprasorb in your tank/filter before adding any invertebrates to the tank. There are copper test kits you can purchase as well to have some peace of mind. Feeding Cherry Shrimp is fairly easy. They will scavenge all over the bottom of the tank and will eat algae wafers and sinking pellet foods. Blanched zucchini or spinach are good vegetables to feed to them on a regular basis. Many shrimp keepers will soon find their female shrimp with eggs under the bellies (also called being “berried” as it looks like little berries). Shrimp are prolific breeders and the females stay berried most of the time. Ghost shrimp are from the lower order of shrimp and breed babies into a larval form. Cherry shrimp are from the higher order and their babies are born as miniature versions of adults. As Ghost shrimp babies are larval they are very hard to care for, needing specific food and other care needs. This leads to rarely seeing the babies survive to adulthood without a specific setup ready to go for breeding. Cherry shrimp on the other hand are very easy to breed, as they can eat the same food as the adults and have the same care. The main thing you need is just to have a male and female and they usually take care of the rest. Many report growing their colony of cherry shrimp from 10 to 50 or 100 in just a few months. The eggs are usually carried underneath the females belly for about 3 weeks and will hatch into the water as tiny versions of the adults, often too small to see with the naked eye. Java Moss is highly recommended for baby Cherry shrimp, as they like to hide and it provides food for them to forage on. If you plan on breeding either of these shrimp, further research is suggested. Scientific Name: Neocaridina denticulate sinenis "red"
Breeding: these shrimp are ery easy to breed. The females will start to turn very red and you will see yellow eggs being held in their swimlets. The females will release hormones into the water and the males will find her and mate. The females can store sperm like guppys and mollys. The female will keep the eggs and then after a while they will release the baby shrimp. The shrimp are miniature replicas of the adults. You do not need to worry about the parents eating their young. For best breeding results keep shrimp without other fish. Tank size: 1 gallon or more. If you keep up with your water changes you can keep 10-15 per gallon. Tank Mates: Most community fish. Do not put with bigger or aggressive fish your shrimp they will eat them. Diet: Will eat biofilm from plants. Also will eat various algae types of algae and sinking pellets/extra fish food. Tank Region: bottom if you have plants/decorations they will climb on them. Although it is a very cool invert to keep, it is not suitable for community tank setups. A smaller shrimp that likes to scavenge. Keep only with smaller sized fish species.